Annual plant, short pubescence or nearly denudate, 20-80 (130) cm tall. It has a taproot system with fine rootlets on which nodule bacterium develop. Stalks thin, ridged, tetrahedral, ascending, climbing, lodging, sometimes branchy from the base. Leaf paripinnate (4-8 pairs), terminates in the branched cirrus. Leaflets are inversely egg-shaped, oblong, ending abruptly, 10-40 x 2-15 mm. Stipules semi-sagittal, slightly dentate, with nectarous spots. Flowers single, sometimes in groups of 2-3, semi-assiduous, auxiliary, 17-20 (45) mm long. Calyx is tubular, almost actinomorphic, 7-22 mm long, short pubescence; denticles are linear-lanceolate, almost equal in length among themselves. Corolla is violet, lilac or pink, purple sides and white keel; less often the flower is white. The column is compressed and hairy. Self-pollinated (northern grades less strictly). Beans broad-linear, bi-valvulate, without diaphragm, usually 9-seeded, 35-65 x 5-9 mm, short pubescence or denudate, with short bent beak, light yellow, less often grey, brown, blackish. Seeds are spherical, slightly compresed, diameter 2-7 mm, different coloring. Weight of 1000 seeds is 40-80 g. This is an extremely polymorphic species. It is frequently poorly distinct from weed-field populations. Grades include Lugovskaja 85, Nemchinivskaja 72, Orlovskaja 88, Belotserkovskaja 679, Krasnoufimskaja 49, Nadezhda, Novosibirskaja, Omichka 3, and Uzunovskaja 91. Chromosome number: 2n=12. Initial area of species origin and morphogenesis is the Ancient Mediterranean, where the greatest number of varieties is now concentrated. It has been cultivated for 6-7 thousand years. The first mention of the species in Russia was in 1775, and active cultivation started with the end of 18th and the beginning of the 19th centuries. The following four ecological-geographical areas were cultivated in the USSR: Southern European (steppe), Central European, Central Russian and Northern. Species is grown for green mass in practically all regions (as far north as 67-69° of northern latitude), except for in droughty territories. Three high-grade crops of green mass per year are grown in southern areas where a long vegetative period occurs with irrigation. The greatest distribution of common vetch for seeds is in the Non-Black Earth Region, the Volga region, in Ukraine, the Baltic, and in Byelorussia. In Transcaucasia and Central Asia, the species is frequently cultivated as a wintering culture. Crops of Common Vetch for green mass occupy 17-18 million hectares (taking into account crops mixed with annual grasses); for seeds, about one million hectares. This species prefers temperate climates. The optimum temperature of seed germination is 14-15°C. Shoots tolerate a short-term downturn of temperature as cold as -5°C. Daily average temperatures of 18-20°C are necessary for maturation of seeds. The sum of positive temperatures from shoot formation until flowering is within the limits of 600-900°C, from shoot formation until seed maturity is 1200-1900 °C, as defined by the northern border of culture cultivation of green mass and of seeds. The vegetative period lasts 74-120 days. This is a plant of long day length. Maximum seed production occurs during periods of 16-18 hours of daylight (southern varieties should enjoy such daylight for 25 days, northern varieties for 35-40 days). Intensity of illumination is also important; therefore, densely planted crops may have decreased productivity. This species is not demanding on the soil. It grows well on cultivated sod-podzolic, wood, sandy, loamy and clay soil. It does not tolerate high standing subsoil waters and saline soils. Soil pH should be neutral or close to neutral, as acidic soils oppress nodules of bacterium. The plant is moisture-loving, producing strong crops in areas where precipitation for May-June is no less than 175-200 mm. It is cultivated for green forage, hay and seeds. Green mass contains 19.7-24.2% protein (under certain conditions of cultivation), 45.49-135.78 mg/100 g vitamin C, 2.86-7.71 mg/100 g carotene, and minerals. The content of protein in seeds is 29.1-34.9%. The productivity of green mass is 2.3-4.5 tons per hectare; for seeds it is 1.1-2.8 tons per hectare. 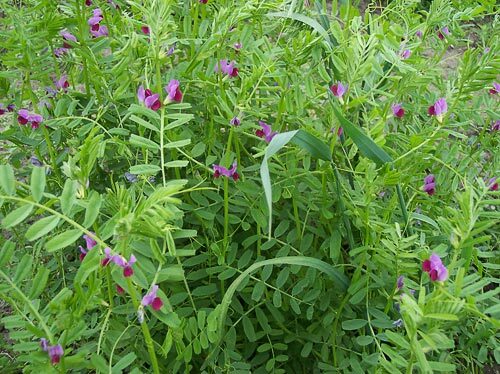 Common Vetch is planted in a mix with summer wheat, white mustard, sunflower, barley, corn, and false flax. This species enriches soil with nitrogen. Goncharov, P.L., Goncharova, A.V., Vasjakin, N.I. 1989. Common vetch. Novosibirsk. Grinenko, P.P. 1961. Cultivation of Common vetch and Sudan grass. Belgorod. Kukresh, L.V. 1989. Vetch. Moscow. Kukresh, L.V. 1991. Common vetch. Biology and cultigenesis. Minsk. Leokene, L.V. 1964. Common and winter vetch. Leningrad. Rep'ev, S.I. 1988. Intensification of vetch production. Leningrad. Rep.ev, S.I., Stankevich, A.K. 1999. Cultural flora. V. 4, Part 2. In: Rep.ev, S.I., ed. Vetch. St. Petersburg. 58-59, 351-366 p.
Vehov, V.N., Gubanov, I.A., Lebedeva, G.F. 1978. Cultural plants of the USSR. Moscow.